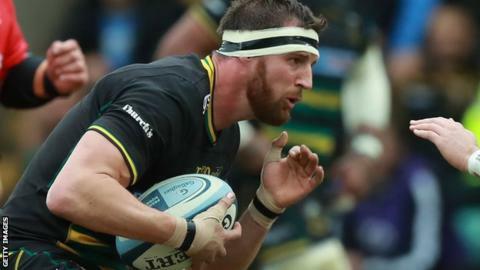 Northampton and England back row Tom Wood has signed a new deal with Saints keeping him at Franklin's Gardens until at least the end of next season. The 32-year-old is approaching 200 appearances for the club he joined from Worcester in 2010, including captaining them to a double in 2013-14. Wood has also played 50 Tests for England since his debut in 2011. "It was always my first choice to stay here, so the decision for me was a straightforward one," he said. Wood scored one of Saints' nine tries in their 67-17 Premiership victory over Sale on Saturday, his 180th appearance for the club. "I feel as fit as ever and I believe we're on the right track towards success under the guidance of Chris Boyd and our other coaches - so I'm really enjoying my rugby," he added. Director of rugby Boyd also praised Wood's invaluable experience. "Since I've been here, I've been taken aback by his dedication to get back to his very best," Boyd said. "When I arrived he had some injury concerns, but he's worked incredibly hard to get that right, and his performances since returning to the side have been top class."